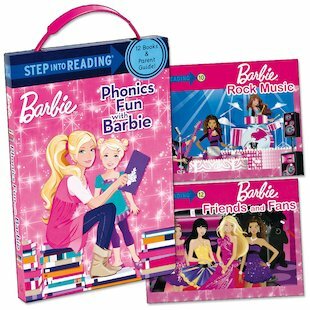 Let Barbie’s good example inspire your kids to read! Twelve dinky colour storybooks practise common vowel sounds and letter blends, helping to build a solid foundation for reading. Presented in a pretty slipcase box, this charming set is the perfect gift for girls who are starting to read. Each mini book follows Barbie through a fun activity – playing games, visiting the fairground, playing guitar in a band – while introducing a specific phonics lesson developed by an expert. Featuring a smart and aspirational character whom girls adore, this set gives children the tools they need to turn letters and sounds into real stories. Slipcase box contains 12 mini paperback storybooks in full colour, plus guidance notes for parents and teachers.